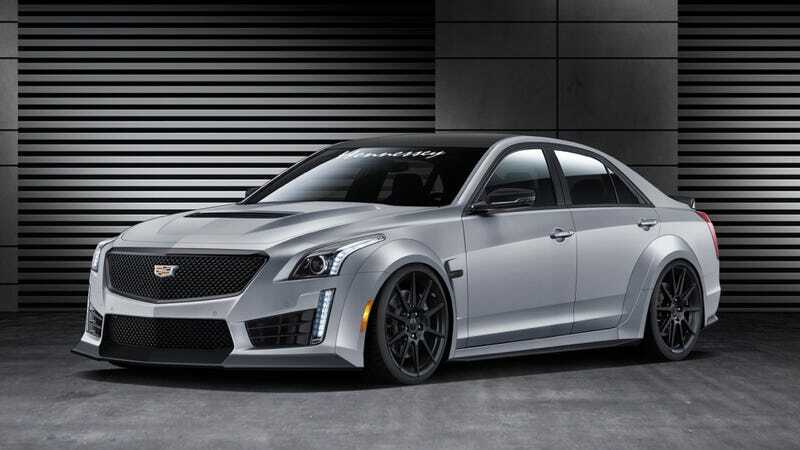 When Hennessey got its hands on the previous generation of Cadillac CTS-V, they took the already-brutal 550-horsepower V8, and cranked it up to 1,200 horses. With the new one, the company appears to be playing it safe for the moment. The Hennessey HPE1000 ups the ante from the 2016 CTS-V, with its 640 horsepower, and makes do with just 1,000 horsepower, which is still enough to banish your face to the back of your head. Four digits worth of horses are just too many horses for you? (Well, why are you going to Hennessey at all, and in reality, why did you buy a CTS-V to begin with, these cars are like doing so many hard drugs) Hennessey’s got you covered, as they’ll do you versions with 750 horsepower and 800 horsepower as well. The Texan company is already claiming the car will do 240+ miles per hour, and while we have to see it to believe it, John Hennessey has a history of backing up his claims in a big, big way. But since the last CTS-V could be had with 1,200 horses from Hennessey, and its latest crazy machine puts out 1,451 horsepower, where do you think it’ll stop?